The shoulder is the most mobile joint in the body. Its remarkable range of motion is achieved by a design with less stability than a ball and socket joint like the hip. The shoulder resembles a golf ball sitting on a tee. It falls off easily (dislocates) and the normal restraints for this are the capsule with its incorporated ligaments, and the rotator cuff. The rotator cuff is a sleeve of tendons whose muscles originate primarily from the shoulder blade (scapula). The tendons of these muscles insert in a ring at the perimeter of the humeral head (ball of the joint). These muscles are so named because they provide rotational motion of the arm. They also act to hold the head of the humerus down, by their general downward inclination from the humerus to the scapula. The deltoid is the most superficial muscle over the shoulder, and covers it like a hood. It elevates the arm but at the same time, elevates the humeral head against the acromion. The deltoid originates from the acromion (shoulder cap), the clavicle, and the spine of the scapula, and inserts halfway down the upper arm. 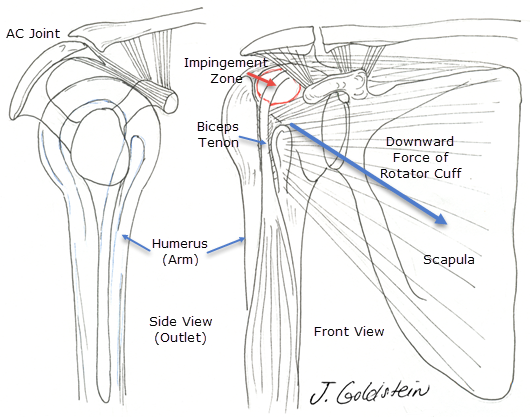 Rotator cuff tendinitis (shoulder impingement) occurs when the rotator cuff tendons are pinched between the acromion and the humeral head. This causes characteristic anterior shoulder pain which is "tooth-ache" like in nature. Pain generally radiates down the front of the upper arm. Overhead activities and reaching at arms reach, aggravate this condition, and reaching behind the back is painful. Neck pain or scapular pain may result with associated muscle spasm. Night-time awakening is common. Any force which causes recoil of the humeral head against the acromion increases symptoms. Throwing or racquet sports may increase symptoms. Shoulder instability, which allows for abnormal motion of the ball relative to the cup (subluxation) may also cause impingement. Repetitive overhead arm use, reaching, or scrubbing motions with the arm may aggravate symptoms. Normally a bursa (sac) is interposed between the rotator cuff and the acromion. This lubricates the motion of the tendons minimizing friction and wear. Normally, the bursa is thin and resembles a plastic bag with a few drops of oil inside. Bursitis or inflammation of the sac causes thickening and less space for the tendons. This causes more symptoms of impingement with catching and crunching sounds on overhead motion of the arm. This occurs as the bursa is pinched between the acromion and humerus. With prolonged inflammation, the rotator cuff tendons are rubbed on directly and slowly are abraded. Eventually this may result in a rotator cuff tear. Here the tendons rip from their attachment into the humeral head. Early this may be painful with little functional loss. A large tear, however, is often very debilitating and causes weak rotational strength and limited arm elevation. The symptoms of impingement on physical exam are fairly characteristic. A special x-ray view is also highly correlated with symptoms. Cervical spine problems or arthritis between the acromion and clavicle may mimic the condition. Treatment is in three stages. Initially, rest from irritating activities and oral anti-inflammatory medicine helps relieve bursal swelling. Rotator cuff strengthening helps hold the humerus down and open the tendon space. If this is not effective, subacromial steroid injection may act directly in the space to rapidly decrease inflammation. More than 80% of patients treated by these means improve to their satisfaction. If symptoms are not relieved, and conservative measures are exhausted, Arthroscopic decompression may be performed to remove the bony impingement against the rotator cuff. This is performed as an outpatient procedure, and has an 85% good to excellent result in carefully selected patients. Those with associated rotator cuff tears may be treated arthroscopically with simultaneous repair of the cuff through a small incision directly over the tear. If the tear is too large, however, a standard operative anterior approach is required. Generally surgery is performed as an outpatient procedure, however with large tears overnight hospitalization may be required. After Arthroscopy describes basic surgical aftercare. The shoulder is highly susceptible to postoperative stiffness. It is important to maintain a normal range of motion after surgery. When Arthroscopic decompression is only needed, rapid return of motion and strength are encouraged without restrictions. With rotator cuff repair, passive elevation only is allowed for 6 to 8 weeks while tendon healing is in progress. Muscle strengthening is then encouraged beginning with rotator cuff strengthening. In summary, impingement syndrome is a mechanical pinching of the rotator cuff increased by certain activities and anatomic variation. Conservative measures generally relieve symptoms in about 85% of patients to their satisfaction. If this fails, surgical intervention improves pain and disability in a high percentage of patients, and often can be performed on an out-patient basis.